Pretty much all of us in business know about social media these days – it’s impossible not to, isn’t it?? But, although there’s a general understanding that social media strategies now play some part in the marketing mix of a business, it can be difficult to understand exactly how to get that right. Today’s social landscape provides a powerful platform where companies can promote their services and cultivate a loyal following for their products by building their visibility in the right market places – if they know how to. What we’ve learnt with the clients we’ve worked with over the years is that to succeed in social media marketing, there has to be proactive approach. It’s important not to fall for the hype here – there are plenty of so-called experts telling you just to be involved – just to turn up at the social media party – but are they really engaging with their followers and the influencers in their sphere, in a way that improves the bottom line? If your social media activity does not provide you with an ROI, then why are you doing it? Millions – in fact. billions of people across the globe – are spending a large part of their time on social networking sites.This is simply a fact – companies ignore that at their peril, and those companies that develop immersive social media strategies and go where their online prospects are, will take advantage of this, before those that don’t. The traditional view and measure of marketing success – “eyeballs” – has a new meaning… it’s now about connections: how you build meaningful connections amongst your following on each platform, and indeed, what those connections will mean to your business in the longer term. That’s the beginning of a social media strategy. There are many companies who do exactly that, though. So, now we understand the challenge, how do we create a proactive social media strategy that will add to the marketing mix and allow your business to cut through the digital noise. Some strategies work and some don’t – that’s clear. The important thing though, is how you will decide whether what you did had value or not. How will you measure your social media activity and it’s results? We are dealing with the the internet “Attention Economy” and how clever can you be when it comes to playing the game? 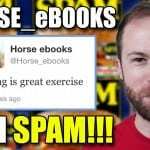 Some ideas are so brilliant that they make you sneeze – but the story behind horse_ebooks shows that perhaps you can be too clever as well. It seems we may even have ideas as to acceptable and non-acceptable SPAM and who (or what) we want to be generating it! How horse_ebooks “horsed” us all…. what a great concept! 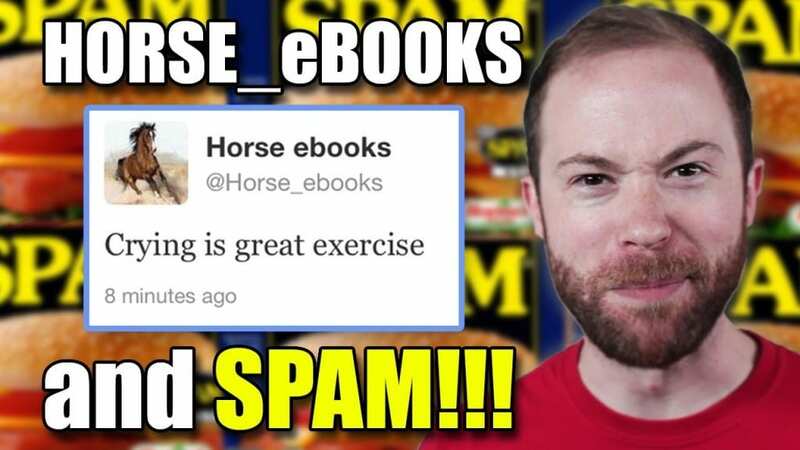 The question asked here by the PBS Ideas Channel is Did Horse_ebooks Show Us that SPAM is the Web’s Native Artform? It seems we can even use SPAM in our marketing efforts, if we understand how to use the social media platforms – and if we’re prepared to create a strategy around getting “found out” as part of the marketing cycle! So … enough already. What about 3 real social media strategies you can use in your business now? Don’t think that simply setting up on Twitter and Facebok is enough. Assess your product, your audience – your market – and find the right platforms for that mix. What about Pinterest? If you are in retail or anything remotely visual, then this is a platform for you. And even if you think you’re not, but you’d like eyeballs from the female population (there’s a lot of them on here), work out how you can be! We use Pinterest for some interesting B2B clients as well as the more obvious B2C clients – check out some Pinterest accounts and boards here. Vine has a DIY feel to it and it’s clear that businesses see a way to make themselves more accessible to their customers by using it – could you use that effect in your marketing? Mondelez International think so – for their Dunkin Donuts brand, they have used their six-second Vine videos as actual TV adverts, and they are looking at how they can use user-generated Vine videos across its global brands, including Cadbury and Oreo. 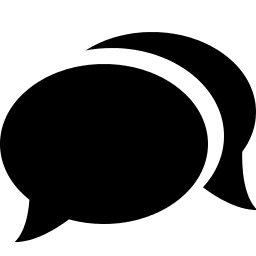 Interesting times – and certainly immersive in terms of social media! Instagram launched as photo platform originally – however you can now use both photos and short videos on this social media platform. if you’d like to know more, Social Media Examiner has a great piece on getting started with Instagram and how to make the most of hashtags. Creating a consistent feel across all of your online assets makes sense – but is sometimes overlooked. You will improve the user experience – which should always be a priority as it’s also self serving – and of course, it strengthens your brand’s identity. Proper connection amongst your online properties including your social media profiles, will drive traffic to your website or your landing pages. a) Ensure you have easy to use and highly visible social media share buttons on all your blog pages and all your website pages. b) Ensure you place cross links where you can – send website visitors to your blog via your web footer or a Blog button, and add your social media links on your website contact page. Not everyone wants to fill in a contact form to get hold of you, and the option of tweeting you will appeal to some. So, why wouldn’t you give them that option? Oh, and don’t forget your telephone number! (We see websites every day with hidden telephone numbers). Similarly, place links back to your website on all your social media profile bios. c) Get to grips with SEO! And we don’t mean just ask your web designers to “do it”. As with any other service you buy, ask for case studies and examples of how SEO work has benefited a business and improved the number of leads they are getting – because that is what it should be about. Search engine optimisation (SEO) warrants a whole blog of its own – and we’ll be on that shortly with an update as it’s such a fast moving area – but there are things you can do now with your social media strategy to ensure you are getting the visibility you want online. Your social media marketing initiatives are key here. Blogs, social media posts and content and of course, your website meta, will all impact on your search engine rankings, but intelligent thought as to how your social media posts are building on use of your keyword phrases and terms will bring very quick wins. Blog activity around your keywords is particularly effective in our experience. More on social media strategies in the next installment. Are there any you are using now that are particularly effective? Let us know in the comments.